We always enjoy visiting with our collectors, so check out our upcoming events and stop by and see us! 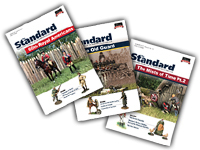 Browse an exciting selection of highly detailed toy soldiers from various ranges including American Civil War, Anglo-Zulu War, World Wars I and II just to name a few. View the latest releases in our extensive line of authentically detailed line of toy soldiers and model figures, along with scenic accessories. Search to find an authorized W.Britain retail location near you!